It was after an uneventful clubbing party that me and Daphne found ourselves going round and round the eastern part of Singapore, thinking of a good place for supper. 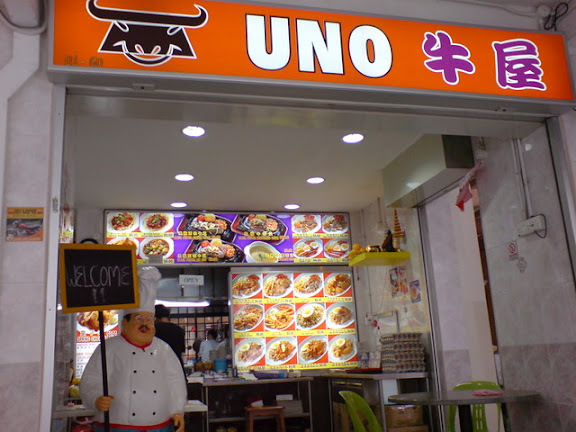 I initially wanted to go to Noor Jannah's to try their "bone steak hor fun", but we got lost and ended up travelling along the (unsavoury) part of Geylang. Somehow or another, I reached Kembangan eventually, Noor Jannah's was there but it was closed! We settled for Irfan's, which was next to it, for supper. This was good, even Daphne who doesn't really fancy mutton soup kinda liked it. Served hot, lots of mutton pieces and very aromatic. Very ordinary, nothing to shout about. Now, I found this to be quite interesting, mini pratas but much thicker (and more buttery) than the usual roti pratas. Very crisp on the outside, and soft on the inside. I think I will be on the lookout for more coin pratas now haha. Daphne had told me about this place some time ago, about how this is one of the better "coffeeshop"-type of Western food at the heartlands, with roughly the same prices. The reviews online were fairly good, so we decided to drop by here for dinner. The chicken chop wasn't all too bad, it managed to distance itself a tiny bit from the usual heartland fare because of the tender chicken meat, but the black pepper sauce was more sweet than spicy. The chicken chop doesn't come with fries, but I was glad that they were fine with substituting the coleslaw and beans with fries (some stalls refuse to do this, and will charge you the same price even without the sides - like the Tenderfresh Western stall at Clementi, in between NTUC and the Clementi Book Shop). The good thing is that Uno has this fried potato ball, which is really fried mashed potato with a buttery taste. While the outside is crisp and fairly hard, the inside is simply soft and smooth. So yummy I ordered more of this haha. In Singapore, the heartland, suburban Western food favourite is either chicken chop or fish and chips. Many have said that you can't exactly find this sort of Western food anywhere else, which gives it a very "made-in-Singapore" feel to it. The fish and chips I felt was nothing impressive, but the fish itself was very fresh. Friendly. This is really two coffeeshop stalls (one Chinese seafood, the other Uno) sharing the area, and they will serve to you the food after you've ordered. $0.70 for a fried potato ball. Me and my guy friends from NUS like to come here for dinner from time to time for our murtabak and fried Indian noodles fix. I understand that this place is just past one hundred years old, can you imagine that? Naturally, it's popular, or at least known, not only with the young generation, but also with the older generation like our parents as well. Seating capacity (second floor is air-conditioned) may be limited, but that has never stopped people from coming here and waiting patiently for a table. I like the murtabak here because they're ever so generous with their mutton fillings. 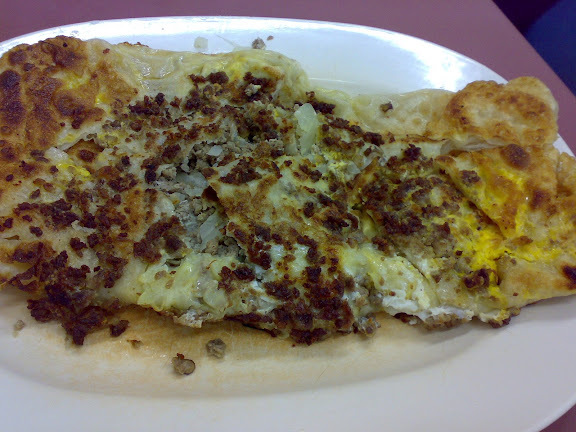 Murtabak is really a larger version of Indian roti prata that has chicken/mutton/beef fillings with onions. 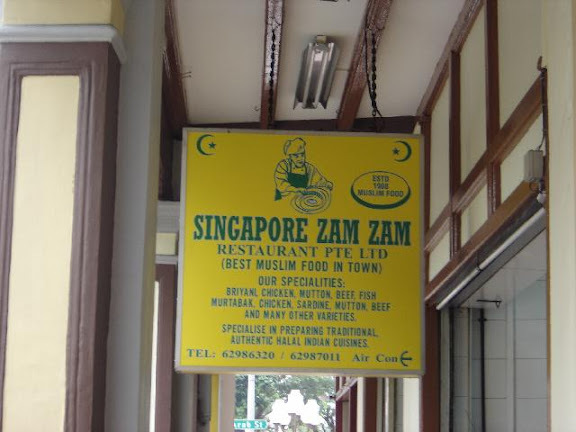 I heard the chicken murtabak is the best one here. They usually serve this with a curry that to me, tastes different from usual roti prata curries, but like what I always do, I will always ask them for the usual fish curry. The latter does better for me. Back to the murtabak, it was served hot, crisp and yes, filled with fillings. Good stuff. The staff are very rushed here, and it can be very difficult trying to get their attention. But when you do, they're usually very friendly. V8 Cafe is one of my favourite places for dinner at Bugis, though I realised that it has been close to eight months since I've last eaten here. If I remember correctly, V8 Cafe came about from a video shop that had outlets in Bugis as well as (the old) Marina Square. The videos have since gone, but the cafe has been standing for a very long while. The food's good, and the price is good too. So good, it has been unchanged for close to a year. Very crispy like a biscuit, but the full garlic taste was lacking. The chicken chop may not be as tender as Astons, but the mushroom gravy was really yummy. I like the way the chicken was cooked, crisp on some sides but soft overall. The fried rice was pretty much okay, the fried chicken tasted good as well. I don't like the mixed vegetables though, but it's a very personal thing. I think mixed vegetables are the worst things ever created in food history, there I finally said it! The usual 7% GST and 10% service charge apply. 1. As the picture above shows, there's a tea break special on weekdays. 2. 15% discount for Safra card members. The decor inside was quite nice, but if you realise the tables are set quite close to each other, which after a while can have a quite a cramped feeling. Imagine all the tables filled, and somehow all the girls sitting on the inside, it did feel like a scene out of a SDU ("Social Development Unit", Singapore's matchmaking "haven") event! But we focused on ourselves and had fun taking pictures, which we realised some other couples doing as well. I think this place can be quite pressurising for introverted boyfriends, or those uncomfortable with first dates, because if every couple seemed to be enjoying themselves and you're sitting there staring at your date, you won't be marked very well for spontaneity and erm, entertainment value. Some of the couples looked terribly bored and you could tell, some were glancing around with a perhaps, slightly envious look. The variety of appetisers from My Secret Garden is typical and ordinary to say the very least, and so we settled on our favourite, and usual, calamari rings. Much better than the ones we had at Swensen's a while ago, these calamari rings reminded us of those served at Fish & Co, crispy and chewy. So if you like those, you'd like these as well. The crayfish was grilled well and was sweet and tasty, but it would have been better if there were more scallops. The spaghetti was ordinary though, but I suppose the highlight should be on the crayfish. The cilantro chicken is really a refreshing change from your typical chicken chop with a tangy-sweet mango dressing and deliciously smooth mashed potatoes. Some of the reviews online found this to be average (again, the subjectivity of taste) but we both agreed this was good. The chicken was well-grilled (or pan-seared to be more accurate) and was tender. To be honest, I didn't expect a brownie, the menu said it was a cake, but oh well, at least it's heart-shaped. The brownie was good though, not too rich and crisp on the sides. Went very well with the scoop of cappuccino ice-cream. Admittedly so, the waiters can be quite blur at times. They forgot the menu, and they forgot the dessert spoons. Thinking back, it looked funny, because me and Daphne were staring at each other smiling and glancing at our empty table. But you've got to give the guys credit for trying to make it up to you, they're effusively polite and always willing to help you take pictures (seems like a secondary job scope), even if they may not necessarily be the best at it. $15.00 for the sin in love. Usual 10% service charge and 7% GST applies. And then surprise, surprise. I paid with my DBS NUS Mastercard, and the bill came with a 15% off. Yayness. Daphne's family was going to have a small celebration one week in advance of her sister's birthday, and they settled on Swensen's at Toa Payoh Entertainment Centre, much because it was nearby and therefore convenient. Naturally, I was invited. Of course, I wasn't taking pictures of everyone's food (I didn't want to scare her parents) but we did manage a few. The few of us who had the soup had little idea what this was, it tasted like a cross between corn and pumpkin. I don't think it was good at all, tasted very much like it was straight out of a can. The calamari rings were alright, but it would have been better if they were more crispy. These on the other hand were a tad soft. Our usual order at Swensen's. Besides, you get this at a dollar off if you're ordering ice-cream, which we did. Very potatoey, served hot, and had the nice soft crunch fries are supposed to have. I simply loved dipping it into the tartar sauce. I found this to be pretty good, tender turkey meat with a nice batter cooked to golden brown on the outside. The spicy fries were good stuff too. This is part of Swensen's August promotion (hurry 8 days left!) and you could check it out at this page. Another one from the promotional menu. Daphne had this, and to me it looked quite good, only that she said it wasn't exactly so. Ovenbaked boneless chicken leg with cheese over it, but she felt it was just alright. She also commented that the mashed potato was lacking in taste. Daphne's mum had this, and it's also from the August "poultry" promotion haha. She said it was quite good. Swensen's claims this to be one of their all-time favourite dishes. I'm not too sure myself. Her cousin Celene had this, and she insisted she prefers the ones served at NYDC. I told her that their standards can be pretty inconsistent, like the one here. I only had a bite or two of this which the sisters were sharing, and I felt that while the vanilla ice-cream went very well with the yummy butterscotch sauce, the banana crumble though was awesomely filling. It was very rich. Good and friendly. Frequently filled our glasses with ice water, a dying trend nowadays. The main courses from the August promotion cost around $16.90, and comes with a soup and drink. For those who don't know by now, Swensen's is certified Halal. For anyone who's looking for a really sweet tea-time, or a really sweet after-meal, drink, this is the one for you. Pure Caramel, so sweet it could give you a sore throat if you don't down multiple cups of water. Daphne loves it though, it was introduced to her by her cousin Celene. I prefer my caramel with coffee. Most, if not all, coffee bean outlets serving food are now certified Halal. Following our pretty good experience at Streets the last time round at IMM, me and Daphne decided to have lunch here again, though this time it was at the Raffles City Shopping Centre branch. I like to eat curries at Hong Kong cafes, especially the one at Xin Wang, and I thought I should give this a try too. It turned out to be not too bad as well, but this curry seems to be closer to a laksa sort of taste, despite seemingly having more coconut. It still didn't stop me slurping the gravy up because I liked the hint of spiciness it had. It would have been good if there were more potatoes. Daphne thought this was good, even if she had her initial doubts about ketchup-flavoured rice. The chicken chop (and its gravy) added welcomed flavour to the rice. Doesn't look exactly that appetising, does it? We really felt that the ones at Zhou's Kitchen are so much better - warmer and crispier definitely. This one we had had some dubious-looking meat filling in them, so not being sure if it was pork or not, I didn't go for further bites. We both thought it would be packed with prawns like the one at Zhou's. Yes, this is a Chinese eatery. But I can't speak Mandarin well enough and it seems that they insist on you trying to do everything under the sun in Mandarin. At least Daphne was around to help, as she always does in instances like this. About $4 for the fried beancurd skin with prawns. It's been a long while since I've posted on my food blog, my sincere apologies to all my readers. It's been a really busy school week, as I had expected this month to be, but I'm glad things will be much better very soon once I've got things settled out. I made time for many food posts this weekend, so enjoy! We'll begin with Udders Ice-Cream, which was on my "I Desire" list for quite a while. It has some really unique flavours like the ones above, and what's more, there's board games available for you to just eat, play and chill out. Me and Daphne actually found this place by chance when we were walking out of United Square's Starbucks, and we excitedly went in for a couple of scoops even when we were supposed to be on our way to a friend's birthday! "Vamilla" is a mix of vanilla (duh), marzipan and almond. 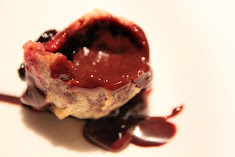 It's fantastic, creamy and nutty and just so good. In contrast, the mango sorbet was plain... weird. It was sour and pretty much tasted like the real thing, the real fruit, which didn't go down very well with us. Very friendly. Games to play and jokes to read haha. $4.90 for a double scoop. Ice-cream depends on type (classic or premium). Joe's Kitchen was one of the food places on the "I Desire" list (see right column), and I was so glad that I could take my friends there for dinner after a tiring day at a freshmen orientation camp. I was telling Daphne that I'm beginning to feel that sense of delightful satisfaction of bringing people to new places to try new food, just as how other more famous food bloggers would organise "makan" sessions. People somehow are seeing me in a slightly different light when it comes to food now, it's quite odd sometimes, but they would be like, "Hey, you're the foodie right, where should we eat?" or even decide for them what they should eat. And of course, I'm getting recommendations from a lot of people of places I should visit, which I truly do welcome because it adds on to my list. Joe's Kitchen is a very simple, unpretentious place along a row of shops located under the block of flats opposite Queensway Shopping Centre and Alexandra Hospital. Many of the shops were closed early and I was wondering if I had gotten the place right since it all looked quite quiet and run-down. Then we saw the bright signboard and heaved a sigh of relief. We're here! YUMMY. We ordered this as an appetiser, and Daphne enjoyed this so much she kept going on and on about how a good a recommendation this place was. Everyone else felt that this was very unique, and for a while we were wondering how it's done, removing the bones in the mid-wings carefully and all. What this chicken wing is stuffed with is a mixture of water chestnuts, corn, chopped chicken meat and mushrooms. There must have been so much work put in for these chicken wings man, as much as they're so easy to eat and can be finished in a few hungry bites! Full of flavour, crispy on the outside and juicy too. Yums! This is very good phad thai, one of the best in Singapore I would reckon. The dried chilli gave it the spicy flavour it needed, and it was just a little moist to prevent it from being too dry. It could have done better with the added crunch of more peanuts, to make it more authentically thai. One awesome thing about this dish, for its price, is the portion. The lady mentioned to us that it's quite a big portion and can be shared by a couple, but all six of us told her we were hungry and just bring it on! She was right though, but we did try to eat as much as we could of this good stuff. This kangkong dish didn't impress any one of us though, because we felt it wasn't spicy enough. You may say it's unfair, but I would compare any tom yum soup with the benchmark soup from MBK Food Centre in Bangkok, Thailand. This soup from Joe's Kitchen comes quite close, but if it was a bit more spicy and sour, it would have been superb. A good thing about this soup is that it's very generous on ingredients, with all the prawns, sliced fish and squids. Even if it's slightly behind the real homecooked soup from Thailand, I would have to say that this is still fantastic stuff! Prices inclusive of GST. No service charge.